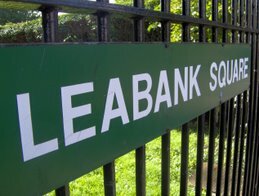 Leabank Square: Leabank Square on the Tour Circuit!! Feel like we’ve really made it now! Last Sunday we had just got back from a family cycle and were just resting our tired legs when we overheard a tour party from across the canal. A guided tour party had just stopped opposite our riverbank and the tour leader was busy telling the group all about the Olympic park and the types of trees that would eventually be planted there, after the games. So we carried on relaxing, thinking they were just your average Olympic tour group, doing the usual circuit around the perimeter of the fence. However, the next thing that happens is that the tour leader asks everyone to turn around and take a look at our riverbank garden. She spends at least 5 minutes bigging up all the stuff we’ve done up there, throwing in lots of compliments about our recycling projects and our plants. Not only that, the tour guide was kind enough to mention our blog address and urged everyone to take a look to find out what other things we get up to! How cool is that?!! Our square actually being a part of a guided tour! We were really proud and elated that our little old square is having such a positive and inspirational effect on other Londoners. I knew we would MAKE IT!! We're on the Olympic TOUR CIRCUIT!!!! One day we will be on the London Tour Circuit! Yeah I know you're going to say that its MAINLY the kids in the Gardening Club and volunteers doing the DIYing - but you know that none of this would ever have happened if you bunch hadn't have started these clubs off! So thanks for putting us firmly on the map, here's to better things in the future! Perhaps we could ask some of the tour parties to kindly contribute some seeds, saplings, cuttings, etc to our communal gardens? Wouldn't it be great if we could entice them to our side of the canal for a donate-as-much-as-you-can-cuppa up on the Riverbank? Well done for putting us on the map man. I keep seeing these ramblers stopping and pointing at our windows, but I just thought I forgot to put my dress on! One of us should actually book ourselves on one of these tours to hear exactly just what they are saying about Leabank Square. But hey well done on getting the Riverbank Garden all looking so lovely. Please make sure you thank the kids gardening club for catching the attention of these tour guides! Plus their idea to put this blogs adress up on the pump station was truly inspired as well! The day might not be too far away when the tours start coming down Berkshire Road as well, maybe we need a sign on that side of Leabank Square as well? Anyway - thanks to all concerned. I saw another tour group this morning, only they looked awful posh mate. Did Gordon Brown wave over to us last week when his cabinet met in the portakabins? I saw all the extra security they had dotted all around from the green, but couln't get high enough to see if old Gord waved hello. Bless him, he's not too bad, its just that he took over when them bankers started diddling us all. Anyhow, I'll grab a photo when I see another tour group ok? Hey Anna - I saw them too! They all waved back as well! Its so nice to be taken notice of recently. At least some people are on our side!